Amazonian aguaje: The quality of our products reflect the complete organic process of aguaje; beginning with our growers in the amazon zone(Pucallpa and Iquitos in Peru). 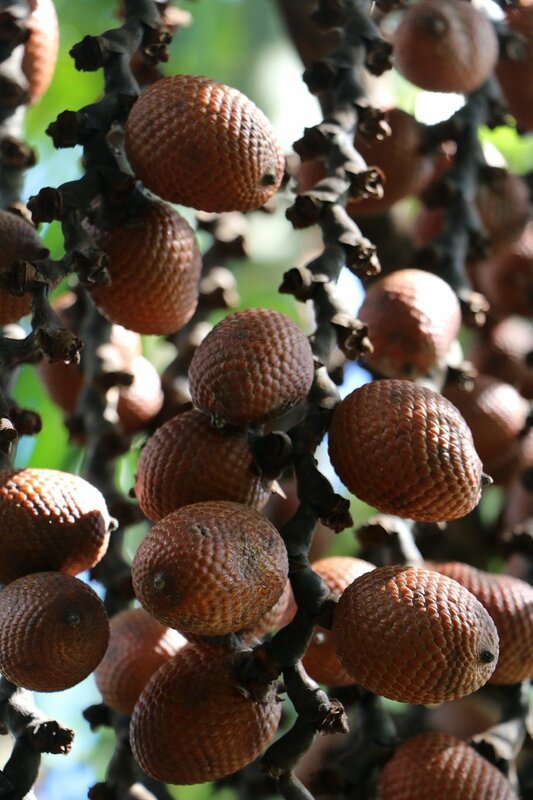 Aguaje is a well-known fruit in the Peruvian Amazon, in its adult stage it is a palm tree between 20 and 35 meters height , it has a sandy color, and have many fruits in its bunches, the fruits are of a dark orange color , it has a big brown seed inside . Only Female Aguajales(Name of the Aguaje Tree) are the ones that bear fruit. Water will always be found around wild Aguajales , Aguajes are related to cochas(Quechua Name for Lakes) and aguajales, they create humid ecosystems and also habitat for endemic wildlife; On the other hand, when the palm tree falls naturally, the famous SURI (worm that serves food in the Amazon) grows in the central part of the decaying palm. The aguaje palm is the largest carbon collector in tropical forests, so Aguaje plays an essential role in mitigating the effects of climate change. The preservation of Aguaje as a resource is very important for the ecosystem of our planet, aguajales can get to store up to 600 tons of carbon dioxide per hectare. In the visits that we have made to many native communities that provide us with this natural resource we were able to confirm the process of sustainable collection used today, it is climbed with rope to the top of the palm tree, without cutting the tree as it was done some years ago, we and our clients should better understand the importance and value of this Amazonian product for the conservation and sustainable development of the Peruvian Amazon. Nowadays, there are not only wild Aguajales and harvesting fruits, currently there are reforestation activities and new plantations of Aguaje palm trees, young plants (1 year of life) and palm trees that were over 10 years old and were already in their second or third harvest year.